This region-free NTCS DVD presents the former Ange frontman in a 1993 solo show, performing spoken-word pieces, sketches, and songs. I’m a pretty big Ange fan, and can easily enjoy music in languages I do not understand, but when there’s no music, it can be difficult to retain interest in words that mean nothing to you. Or almost nothing – my rusty French allowed me to catch the drift of a few bits if none of the details. From the audience reaction, he’s a pretty amusing guy, and I don’t think it’s only because of the funny hats. His performance is in a way similar to the kind of performance art Laurie Anderson used to be known for. There’s a recurring bit where he calls various people on a toy telephone and a taped voice answers. As for the music, he’s as riveting as ever, accompanying himself on acoustic guitar or digital keyboard, singing with great charm and expression. 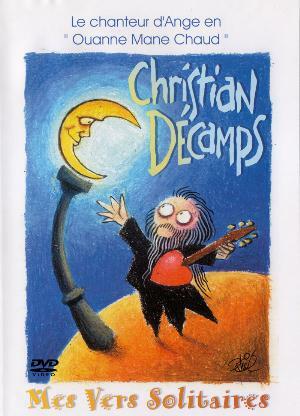 One old Ange classic, “Ode à Emile” is included in the set, along with a couple of Jacques Brel tunes and works from Décamps’ solo career. The camera work is nicely done, with movement and effects that don’t intrude upon the performance, as well as a few segments of other video. On the whole, I can really only recommend this to French-speakers or die-hard Ange completists.